simplecall was created with one goal, and that was to provide affordable and easy international calling to people who call Bangladesh. This is why simplecall came up with a unique and revolutionary cheap calling service to call Bangladesh - calls start from just 4.5¢ /min to landlines and mobiles. Simplecall is different to all other international calling providers because of our uncomplicated calling process. 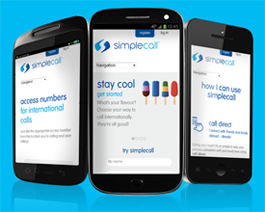 With simplecall you don’t have to dial complicated PIN numbers or card codes because we are a PIN-less system. All you need to do is dial from your landline, mobile or even your PC, and start making phone calls, effortlessly. You can even store your most-called destinations using our call direct feature, and once it is saved, you can call that number with the press of a button. simplecall believes in transparency and this is why all our rates are advertised on our website. Unlike what many cheap call providers claim, simplecall will never charge you more than the rate we advertise - you only pay for what you use and nothing more! To start enjoying the benefits of cheap calls to Bangladesh and be able to talk to your family and loved ones for hours, please register with us and start calling your friends and families.